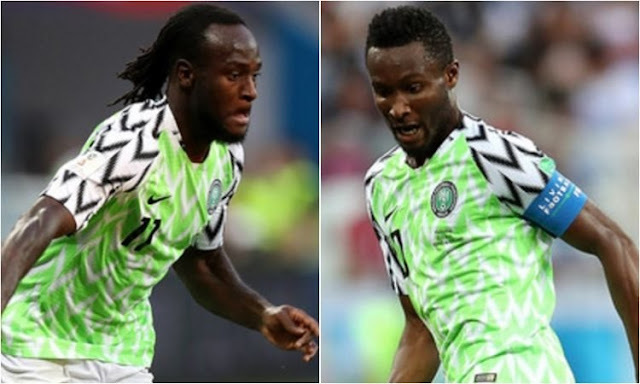 London outfit Crystal Palace are looking to reunite Nigeria international of John Obi Mikel and his former Chelsea team-mate Victor Moses at Selhurst Park. The Eagles are one of the several Premier League clubs interested in signing Super Eagles captain who has indicated his interest to return to Europe after terminating his contract with the Chinese Tianjin Teda while last season FA Cup winner is out-of-favour at Stamford Bridge could be back to Selhurst Park, nearly a decade after he left for Wigan. According to Team Talk, Palace are in the market for a central midfielder and have identified Mikel as a potential target with Roy Hodgson wants to enhance his relegation-threatened squad and former Lyn Oslo would add experience at the heart of his midfield. The South London club are also interested in bringing their former academy star, Moses back on loan to Selhurst Park after struggling to earn a place in Maurizio Sarri's Chelsea squad. Mikel has bags of Premier League experience with 249 games to his name winning two Premier League titles, three FA Cups, Champions League, Europa League, Caraboa Cup, FA Community Shield in more than ten years at Chelsea, prior to his move to China in January 2017.